Located a little over 50 miles outside of Tokyo, Mount Fujican be seen from higher hotels like the Park Hyatt, though that is more the exception than the rule. The sky must be clear to see the grandeur — it’s better to make the trip outside of Tokyo to truly appreciate the beauty of Fuji-san. Tradition holds that the best time to be at the top of the mountain is when the sun rises. The sunrise is also known as Go-raiko. This means that climbers must arrive before dawn, which is at approximately 4:30 in the summer. The climb can take five to eight hours. Some do this by climbing most of the way the previous afternoon, spending the night at a way station along the route, and finishing the trip in the early morning. Others start their climb at midnight. How you approach your climb depends on your style. Most climbs begin at the fifth station at Kawaguchi-ko, possibly because buses from Tokyo stop here. There are other fifth stations associated with other paths up the mountain. If you’re driving (and we don’t recommend that), the road ends at Kawaguchi. You will then climb the 10-station Yoshida trail. Hard-core climbers can start at the very bottom of the mountain, of course. You’ll pick up the trail at the point where the shops and restaurants end — just follow the crowds. You will climb a series of switchbacks. Mt. Fuji has separate trails for ascending and descending, so the whole process is very orderly. There are shops and huts along the route that are open 24-hours if you need hot soup or a break. There are also futons available for naps. When you reach the summit, you might succumb to the urge to send a postcard to friends and family. Luckily, there’s a post office right there for you. After the sun rises, you will then circumnavigate the crater before beginning your descent. You will pick up the Gotemba-guchi trail by the post office (just in case you waited to send that postcard, you have another chance) and start your way down. Some would suggest that this where the fun really begins: think giant sand slide. After the stately procession to the top and reverent viewing of the sunrise, the climb down is like entering a playground. People run, jump, and slide their way to the bottom. The descent takes an hour or two, depending on how athletic and bold you are. Go down at your own pace. The region surrounding Fuji-san has developed a program to encourage tourists and visitors. You can join the The Mount Fuji Welcome Card program, which gives foreign tourists discounts of about 10 percent on services at 211 facilities, such as hotels, restaurants and museums in the Fuji, Hakone and Izu regions. The card can be printed out by visiting via the Web site at Mount Fuji Welcome Card. From Tokyo, you can catch a bus from the Shinjuku station. You will be taken to the fifth station (Kawaguchi-ko). A one-way ticket is approximately $30 USD, though this can vary with exchange rates. Shinjuku is reachable via Tokyo’s various subway lines. There are also shuttle buses from Kawaguchi-ko that connect with other stations/trails around the mountain. The trip approximately 2.5 hours. Catch the limited-service JR Chuo Main Line at Shinjuku Station and transfer at Otsuki Station. Take Fujikyu to Kawaguchi-ko Station. Take a bus from Kawaguchi-ko Station to the 5th station of Mt. Fuji. The trip is about 2.5 hours. 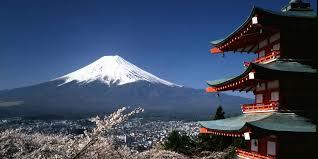 There is a Japanese proverb that states only a fool climbs Mount Fuji twice. And real fool climbs the mountain unprepared. Do your homework before ascending the mountain. Despite the fact that the mountain rises 12,389 feet or 3,776 meters (how in the world do they know this for sure? ), the climb is relatively easy. However, the final stages do get steep, so be prepared for a workout. There are chains along the path for support. During peak climbing times — July and August comprise the “official” season — the paths are packed with people of all ages. Comfortable walking shoes are the best choice for the climb. Expect thin air as you climb. If you get dizzy or sick from altitude sickness, stop. Do not push yourself just to prove a point. The mountain will be there next time. Before your climb make sure you have sturdy shoes, rain clothes, flashlights and batteries (especially if climbing at night), sunscreen and sunglasses, and, yes, toilet paper. It can get cold even in the hottest of summer. The height of the mountain means chilly weather year-round. Temperatures can drop to a freezing 5 degrees C in the summer. That’s really cold. Be prepared. If you wish, bring a walking stick along, or purchase one at the fifth station. You can get stamps along the route to commemorate your climb. Take frequent breaks and bring water. Higher altitudes require more water, and you want to have plenty on hand. While there are food stations along the way, it doesn’t hurt to have something to eat with you. If there is a worst-possible time (other than off-season) to climb the mountain, it would be Obon week in mid-August. This Buddhist holiday translates to long lines on the climbing trail. Great for people-watching, frustrating if you want to get to the top in time for sunrise. At the end of the climbing season, the Japanese celebrate the Fire Festival of Yoshida, a major festival. If you climb out of season (which is illegal), remember that many of the services are closed, though fifth-station businesses remain open year-round and some huts on the trail might be open. Expect freezing temperatures and snow. Out-of-season climbs are very dangerous. Mount Fuji, or Fuji-san, the highest mountain in Japan, straddling the boundary between the Shizuoka and Yamanashi prefectures. West of Tokyo, it can be seen from that city on a very clear day. The Pacific Ocean can be seen from the mountain. The mountain is located in Fuji-Hakone-Izu National Park. Surrounding the mountain are five lakes: Kawaguchiko, Yamanakako, Saiko, Motosuko, and Shojiko. The lakes provide excellent views of the mountain. A volcano that last erupted in 1707 (the Edo period), Fuji also fuels hot springs such as the famous springs of Hakone. The mountain is at low risk of erupting. Fuji-san is a frequent subject for Japanese art. Ukiyo-e painter Hokusai’s masterpiece is known as 36 views of Mt. Fuji. It is also featured in literature. Perhaps no image is more closely associated with Japan than Mt. Fuji. The distinctive shapeis both iconic and revered — and climbing the mountain is a rite of passage for citizens of Japan.